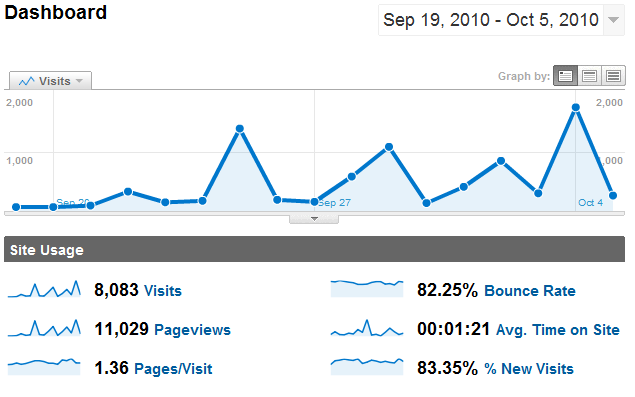 Over the past month I’ve started pulling in some modest traffic to this blog. Now that I’ve gotten a few thousand visitors over that past few weeks, I thought it might be time to do a quick analysis of my traffic. As you can see, my traffic goes in spikes. Each of those spikes corresponds to when a new article is published. Without the outliers, there is still a steady increase in traffic. I’ve also noticed that over the past several weeks my average time on site has increased to over 1 minute ( it was somewhere near 45 seconds before I started posting articles frequently). 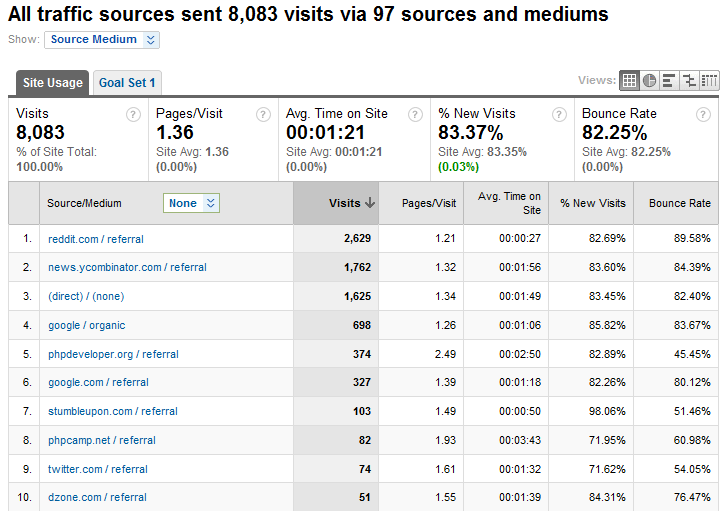 The best stat on here for me is that I actually have returning visitors. Granted, they only make up ~16% of the traffic, but it’s still good to see. As you can see, I clearly have Reddit and Hacker News to thank for my traffic numbers. Without you guys (and girls), it wouldn’t be nearly as fun to write. However, there is some interesting info tucked away in that table. The most important piece is “Avg. Time On Site”. Reddit’s average time is only 27 seconds, as opposed to Hacker News which is nearly 2 minutes. This tells me that the typical Reddit user probably has no attention span (likely) and I should probably add a TLDR block at the beginning of each article (I won’t, don’t worry). On the other hand, this might just mean that Hacker News users open up a ton of tabs and it takes 90 seconds on average to get to mine. I tend to think it’s just lower brow traffic from Reddit, but I’ll give them the benefit of the doubt. The bounce rate from Hacker News is also slightly better, but still nowhere near as good as traffice from PHPDeveloper.org or StumbleUpon. There aren’t any surprises here. 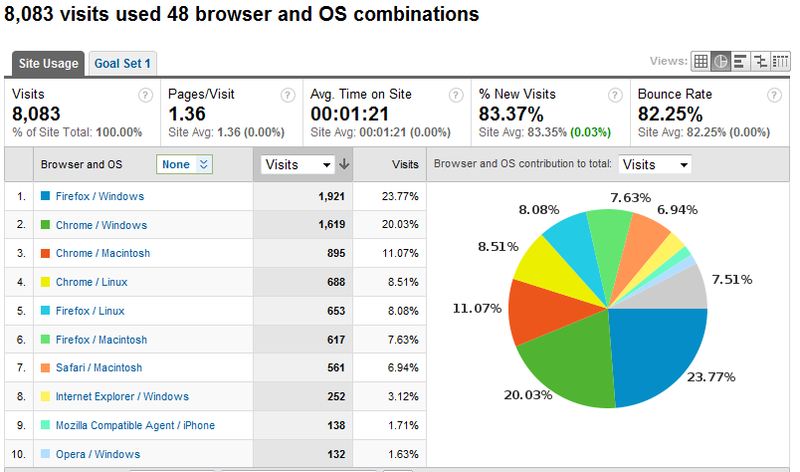 Windows + Firefox is leading the pack, with Windows + Chrome closing in right behind them. Mac users are also making a strong showing. As this is a technical blog, this doesn’t surprise me at all.